“Baby Maureen” is the only person we can (partially) identify in these pictures. Here she is, with (possibly) her parents and another man. Might her mother be cousin Bessie Quinn? More Mystery Cousins! 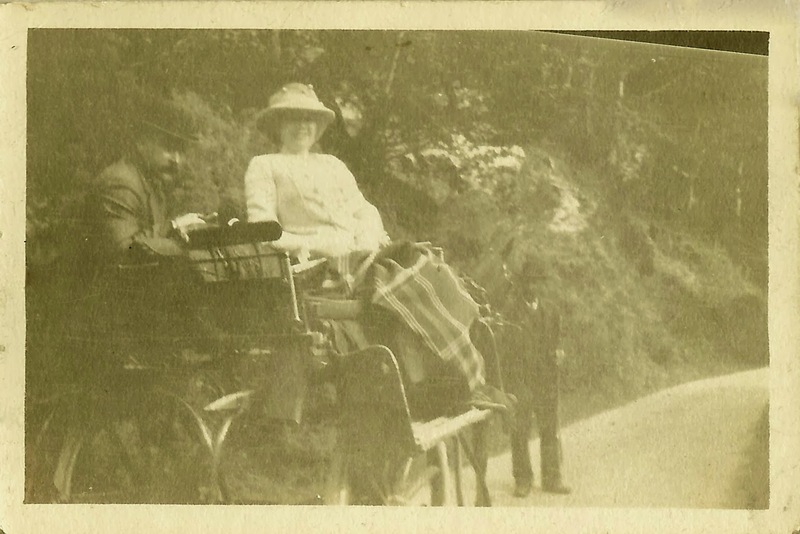 As with the other photographs we’ve seen recently on this site, these come from my great-aunt Detty’s (Benita McGinnis McCormick) scrapbook pages of her 1913 visit to Ireland. She had a grand time on the “auld sod,” visiting with her Irish cousins, and these photographs show they were quite a playful lot. younger – maybe her older brother? Unfortunately, as we have seen already, Aunt Detty unwittingly left it to us to figure out just who these lovely people were by not leaving us any identifying information about them. Our family’s Irish ancestor surnames were McGinnis, Healey, Kelly, Gaffney, and Quinn. Because Benita’s father, Thomas Eugene McGinnis, lost his parents when he was a small child, he might not have known much about his relatives in Ireland (where his father is said to be born) or in Scotland (his mother’s birthplace, according to some census records). For this reason, I would be less inclined to think any of these people were McGinnises, though I would not rule it out entirely. I know nothing about the Healeys and the Kellys, except that they are ancestors of the Gaffneys and the Quinns, respectively. As noted previously, we have a picture of Benita’s cousin, Eileen Kelly, with the McGinnis family in their Chicago home in 1919. I am fairly certain Eileen traveled with Benita to Europe, as her name appears on the ship’s manifest back to America. Hence, we have another hint that the Gaffney-McGinnis family kept ties with their Kelly relatives in the U.S. and maybe back in Ireland. That could make the Kelly branch another possibility for these pictures, though Eileen will have to await her turn patiently while I try to confirm her family connection at a later date. So many relatives, so little time! While Benita’s father’s family seems a remote possibility for the “surname photo match game” we are playing with these unidentified photos, her mother’s (Mary Jane Gaffney) family might be more likely candidates. Take her maternal grandfather’s side, the Gaffneys, for example. 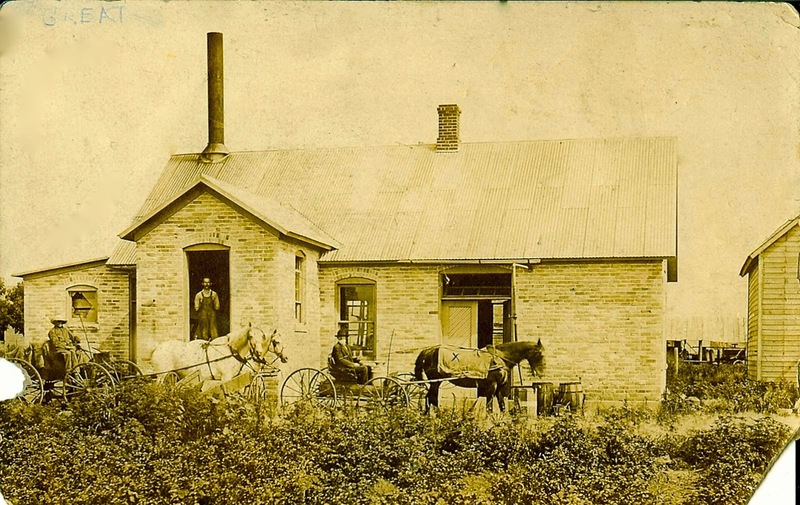 Most, if not all, of Benita’s Irish grand uncles and grand aunts had settled in the midwest and kept close contact with one another. It would make sense that they also kept their ties to their extended family back in Ireland. Benita’s maternal grandmother’s family, the Quinns, pose a stronger possibility. Take a look at the picture postcard below This postcard did not belong to Aunt Detty but to her younger sister, Alice (McGinnis) Schiavon, my maternal grandmother. 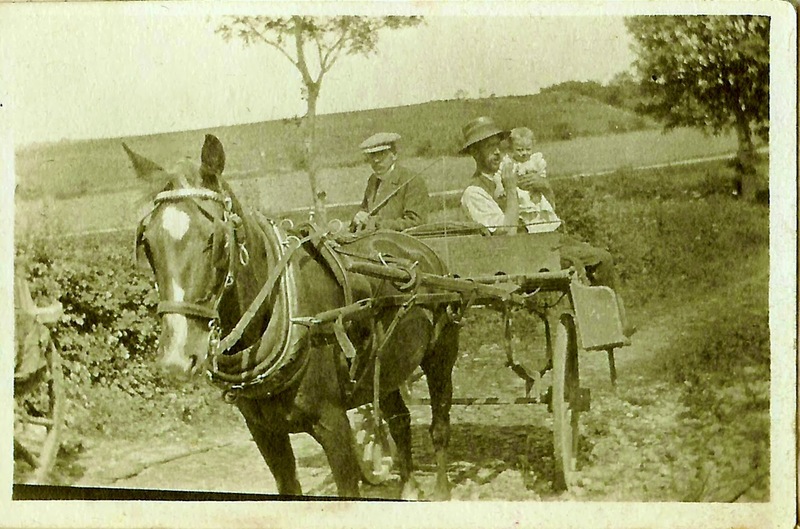 Picture Postcard of “Grandpa” Quinn and Lilly the old driving horse. The location, somewhere in Ireland, is unknown. Like Aunt Detty, note that Bessie Quinn does not mention “Grandpa’s” first name! The dedication leaves no room for an address or postage stamp. 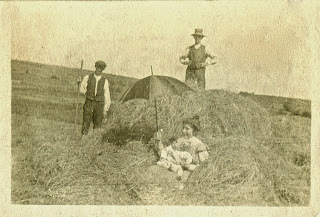 The vintage of the picture is similar to Aunt Detty’s photos of her trip to Ireland in 1913. This suggests that the card was either mailed to my grandmother in an envelope or hand-delivered by her sister when she returned from Europe. In either case, the postcard provides evidence that the American Gaffney-McGinnis clan and the Irish Quinns stayed in touch. Now take a look at Lilly the horse. She resembles the horse in the other pictures here. The carts in the pictures all look alike, too. Yes, it’s a long shot, but could we infer from these pictures that these people are cousins from the Quinn branch of the family? And we haven’t even talked about location. We know the cousin who worked at Mountjoy Prison probably lived in or near Dublin. 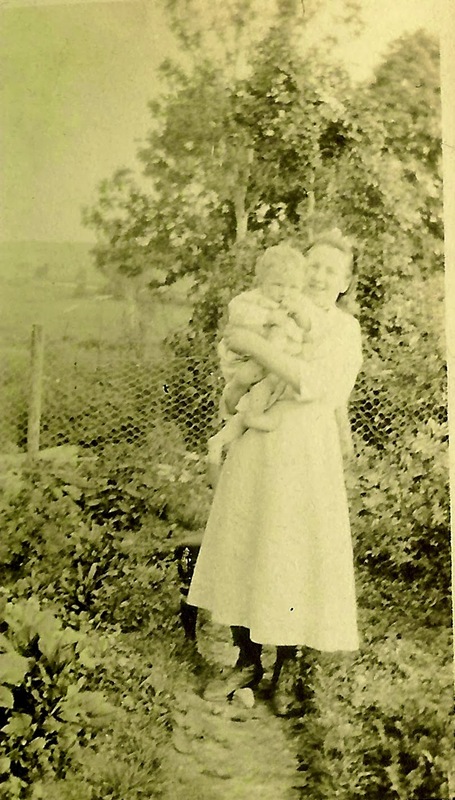 We also know that Bridget Quinn, Benita’s maternal grandmother, was said to be from Boyle in County Roscommon. But the two places are about 100 miles apart, leaving the location anybody’s guess. Cherubic Baby Maureen and nurse. With these theories in mind, let’s have a further look at these charming photographs, particularly of those with Baby Maureen. The women in these pictures seem to be several years apart. Based on the style of her hair and colorful clothing, I would guess that the woman in the very first picture at top, sitting with the baby in a bale of hay, might be Maureen’s mother. The pose is quite charming with the umbrella suggesting she was protecting her baby and herself from the rays of the summer sun overhead. 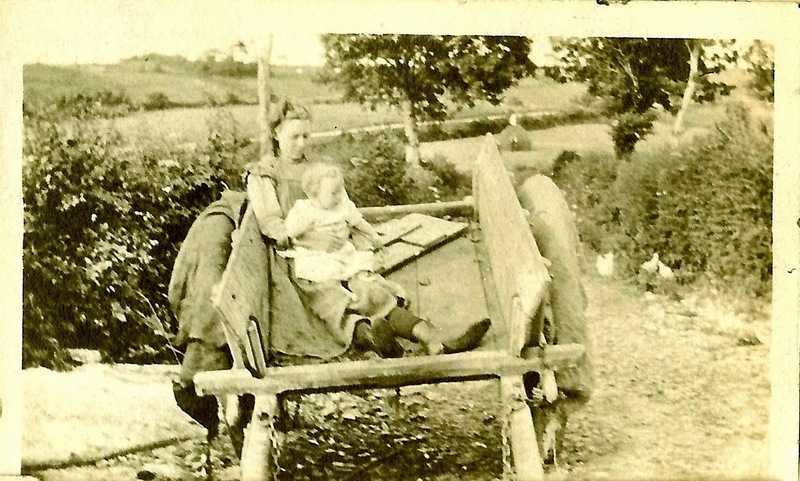 It would seem that the man behind her might be Maureen’s father, especially as he appears in the picture right after that, this time holding the baby in the horse cart. Maureen’s “nurse” wears her hair down, suggesting she is a young unmarried woman. I wonder if she is a nanny or one of the nurses from the hospital at Mountjoy Prison? Or was there no relation at all between these cousins and the cousin who worked as “chief” of the prison? Don’t you just love a good mystery? Well, I do love solving a good mystery! Hope you are getting close, with your ideas about the Quinn connection, Linda. With location of county, the closest I've come to finding name connections has been through baptismal records in Ireland. Hopefully, you will be able to tap into a cache of such records in the Dublin area and around County Roscommon and find some possibilities. Best wishes to you in this continued search!